Part of the Safco Impromptu Collection, this mobile storage center is sure to get the job done whether it's a spur-of-the-moment project to everyday storage needs. 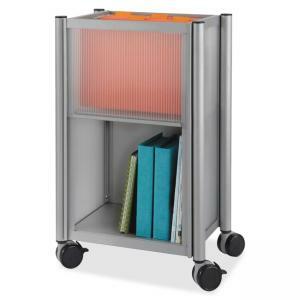 Design includes alluring polycarbonate panels, steel frame, an open top area for hanging files and binder storage underneath. From small collaborative and teaming areas to conference and breakrooms to personal spaces, the Impromptu collection creates a functional environment without sacrificing design aesthetics. The storage center fits under your desktop to keep all active projects within easy reach. Use the convenient top bin for hot files, filing to-do or collecting paper recycling. Bin holds up to 50 letter-size folders. Storage center easily rolls to where it's needed on four 2-1/2" swivel casters (two locking). Steel frame has a powder-coat finish.